This hey fever is nothing to sneeze at. Gobble on! What good’s a holiday if you can’t have some fun? Gobble, indeed! 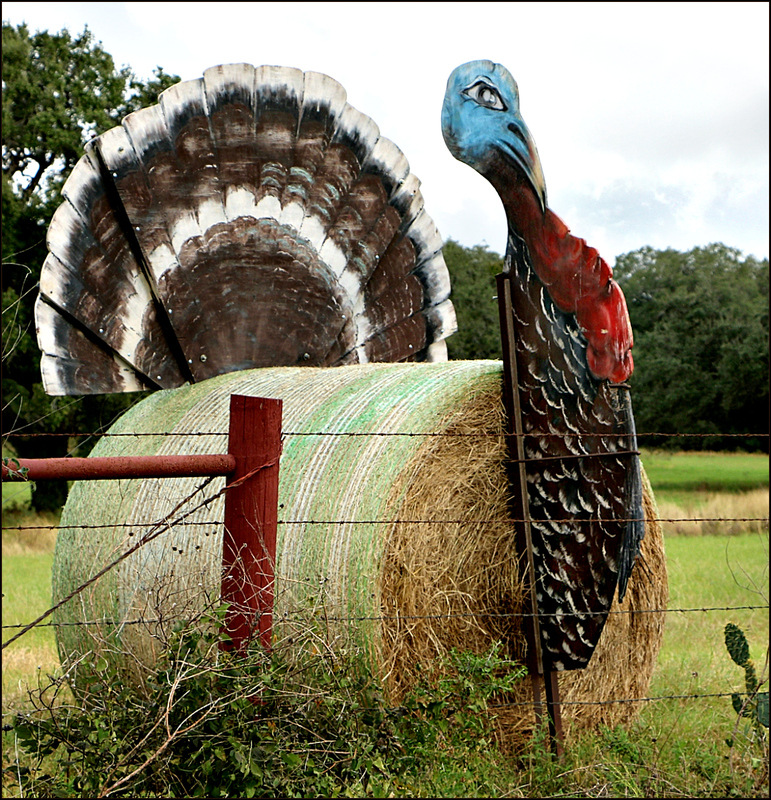 Is this “The Turkey in the Straw”? It just might be. On the other hand, it might be “The Crippled Turkey” that Bob Wills, the man from Turkey, Texas, enjoyed playing. “Crippled Turkey” reminds me of two old male turkeys that used to come to our bird feeders for a couple of years. We called them Willie and Pete. Pete had a crippled, twisted leg that got progressively worse over the years making his walking quite a chore. But he dutifully made his way to the feeders everyday, sometimes two or three times. His perseverance was inspiring and I was deeply saddened when he stopped coming. I am sure he would have liked Bob Wills. It’s always sad when a creature who’s become part of our life disappears — particularly when the reason for the absence is predictable. Still, he lived out his time being cared for, and that’s no small matter. I’m sure he appreciated that feed — and he might well have liked Wills’s music. There’s sure a lot of stuffing in that turkey! More leftovers for thee and me! Happy Thanksgiving to you, too, Terry. Thanks, rethy. I wish you could be here to share it with us! Happy Thanksgiving to you too, Linda. Now that is what I call a turkey. Original too, I reckon. Oh, I’m sure it’s original. It’s fairly common to see round bales turned into pumpkins, but I thought this was especially creative. I’d put it right up there with tumbleweed snowmen. Oh my. Tumbleweed snowmen. I have not seen pics of those. Do you have any of the tumblers? I have a tumbleweed, and I’ve seen tumbleweed Christmas trees,but I don’t have a personal photo of tumbleweed snowmen. They’re apparently really big in Arizona, in every sense of the word: big in size, and popular. I love this one, from Albuquerque. Very impressive. Who would have thought a tumble weed could help make a snowman? Isn’t it great? It’s fun knowing that the same sort of thing goes on in New Zealand; thanks for sharing that wonderful tidbit. Creativity knows no bounds, even on a back road in the country. Somebody with acreage has a sense of humor. I wonder who they got to make the head and tail bits? Hope your turkey day is everything you hoped it would be. The concept’s great, but the execution was just as good. Whoever did it clearly had some skills. I found it in the country around Goliad — it certainly was worth slamming on the brakes for a photo. Happy Thanksgiving to you and yours — and a special hello to your mom. The pleasure’s been all mine. In a world with more than its share of ‘turkeys,’ your voice is one I always enjoy hearing. Oh lovely! I had forgotten that meaning of the word turkey. That’s my smile for the day. Here’s another smile: ask any child what sound a turkey makes, and you’ll be rewarded with something like this. There still are people around who always refer to turkeys as gobblers; my grandparents did. Funny! No Turkeys around here to try out my gobbling sound. That’s a baleful-looking bird if ever there was one! Have a great day! Can you hear me groaning and laughing at the same time? No baleful looks here, and I hope not there, either! Well, look at it this way, Jeanie: ’tis better to eat a bit of turkey than to be a turkey! Happy Day(s) to you and Rick, and the rest of the clan, especially Lizzie Cosette. Give her an extra pet for me. I always like these “hayball sculptures”! Aren’t they fun? Jack-o-Lanterns, snowmen, and Christmas tree balls are fairly common, but this is the only turkey I’ve seen. Happy Thanksgiving to you, Mary, and the rest of the crew! Isn’t it fine? If you meet one of its friends on your flight, be sure and snap a pic! Safe travels, and happy Thanksgiving! It appears that way, doesn’t it? It seems to have left him both well-nourished and feisty. Given the look in his eye, I don’t think I’d want to tangle with him out in the barnyard. Creative urges know no bounds — and who doesn’t love public art? That’s great! Kudos to the designer and the one who captured it for the rest of us. This turkey was so far into the country I’m sure it was homemade; perhaps it was a family project. In any event, it would have been fun to construct, and fun to come home to every day. It’s impossible for me to look at the photo and not smile, just like I did when I first saw it. Some things almost demand to be shared. Barb and I attended another artist’s inauguration for a 2-month show on another level of the same museum. We drove in early to stop at |KFC where we could use the wifi and dine via an untraditional Thanksgiving menu!!!! Hope you are enjoying the long weekend and have dodged the black-friday madness! That may not have been the most traditional approach, but on the other hand, it’s the giving thanks that counts, and not the food. I do remember with some affection my most untraditional Thanksgiving dinner, at a Greek restaurant in Chicago. Think the movie “Christmas Story” moved to Thanksgiving, and you’ve got it. It’s been a fine weekend, with not a hint of black in it. I’ve not only avoided the stores, I’ve managed to avoid the breathless, obnoxious advertising as well: at least, most of it. We just returned from breakfast, are about to go to the airport and pre-check in Barb’s itinerary, then we ‘planned’ to first go to the mall and then to the Malecon 2000 and the fantastic MAAC Museum which anchors the upper end of the malecon… but now, the thought of Black Weekend at a mall gave us both pause.. yes, black everything has stretched its materialistic fingers this far south. Christmas trees, lights, etc were up weeks ago, and now shoppers are shopping, having gifts wrapped, etc… I might have that deer in the headlights look if the mall is crammed with shoppers! enjoy your quiet day, dear friend! It’s very quiet right now; we’re blanketed with thick fog which isn’t predicted to lift for another hour or so. As soon as I can see the road, I’m going to head out to somewhere for a while. There’s a front coming, with strong west winds, and once it’s blowing 25-30 mph, my photography skills go kaput! No matter. There’s a little housecleaning that can be done, and an assortment of other at-home chores. With some nice music and a cup of tea to go with the howling winds, that still beats a shopping mall. Enjoy your day, whatever you do. si – winter arrived early in mississippi – I’m glad to be here where the coolest it gets is low 70’s. We’ve had for at least a month a ‘fog’ but it’s one that worries me greatly. These fogs last all day, and they are caused by the slash and burning that’s happening in the province. The drive to gye yesterday was difficult, and barb was hanging out the window snapping images for me. Do I dare post “Manabi Burning”? They might consider me unworthy of visa renewal. None-the-less, the exposition is calling attention to my concerns, and it affected the minister of culture for the province. Still, the fires and desecration is alarming. we’re heading out now — may your drive thru the countryside be a lovely one! I would never think to create something this whimsical and amusing, but I love coming across them as I travel the country roads. I know roughly where this one is, too. It’s a little far from home, but I’ve thought it would be fun to go by during the Christmas season, to see if they have something equally creative at their gate.